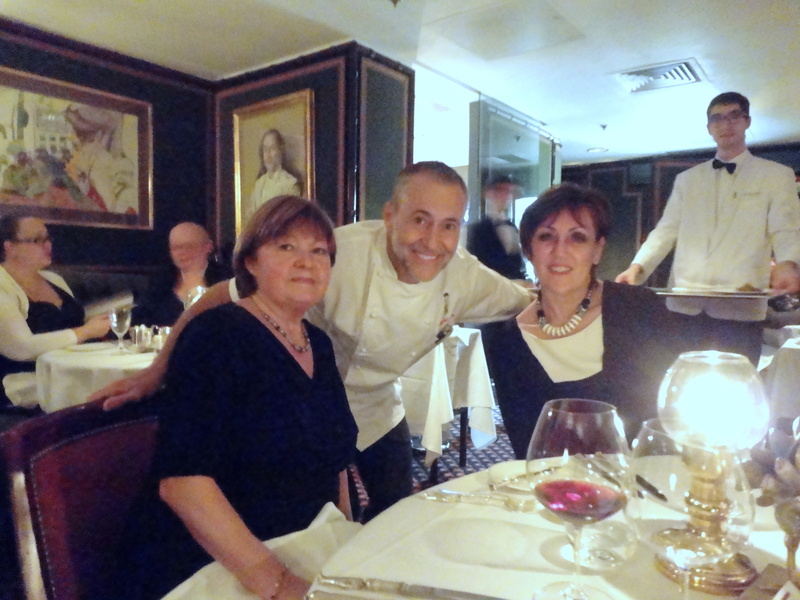 A bastion of cooking in the UK, Le Gavroche should need little introduction. If you haven’t heard of the restaurant, named after the urchin from Les Miserables, you will certainly know the family behind it. The Roux brothers (Albert & Michel Snr) journey began in 1967, a notable milestone along the way the accolade of the first UK restaurant to win 3 Michelin stars in 1982. Under the stewardship of Michel Roux Jnr it has held 2 stars since 1993. It is also one of the hardest reservations to get in London, calling 3 months in advance managed to secure me a table for 1700 on a Monday evening for the occasion of my mum’s birthday. Located close to Marble Arch and amongst residential and solicitors offices in Mayfair you come across the iconic sign. Before you have had time to think the door is opened and you are greeted in a small bar area, the lower ground floor is where the action really happens though. The dining room is a mix of rich greens and reds with artworks adorning any free wall space. You do a sense of the special history of the restaurant from your surroundings. [It does also add up to low lighting so do forgive the photo quality.] They have also recently introduced a private dining area named “The Chef’s Library”. The culinary offering consists of both a tasting menu and a la carte option. On the evening we dined there were also a handful of seasonal specials to choose from. After a little debate we chose the 8 course Menu Exceptionnel. Ever present as the first course is the Soufflé Suissesse, a cheese soufflé that is twice baked with cream and gratinated with extra cheese. A combination of the lightest of egg whites and decadence of the cream cheese it is hard to think of a more perfect start to a meal. Next up was quite a simple carpaccio of filet of beef with pretty, pickled vegetables. 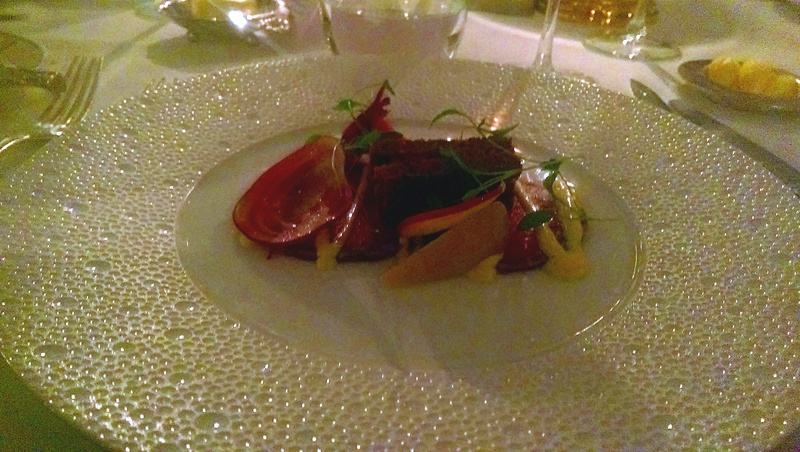 The real star of the dish was a rectangle of rye bread that had salt beef through it which lifted the flavour profile. On to two fish courses; a single, plump, sweet scallop now arrived. 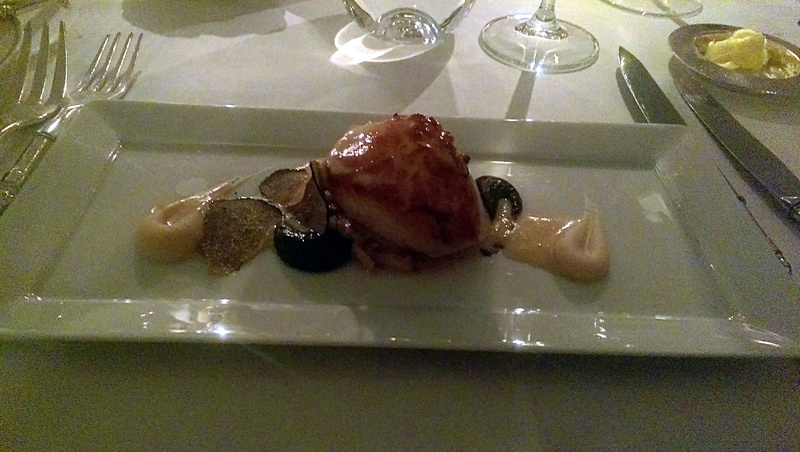 The accompaniments I wasn’t quite so sure about, a white bean puree, mushrooms and truffles having a nice earthy balance against the scallop but lacking a little in freshness and texture. Bass I felt was more accomplished with beautifully fragrant ras-al-hanout running through but not overpowering the fish. Alongside the bass fillet there was a pastilla, almost a crispy fish spring roll, although really a traditional Moroccan ‘pie’. Whatever it was it was divine. The fifth course employed a slightly more modern minimalistic presentation. 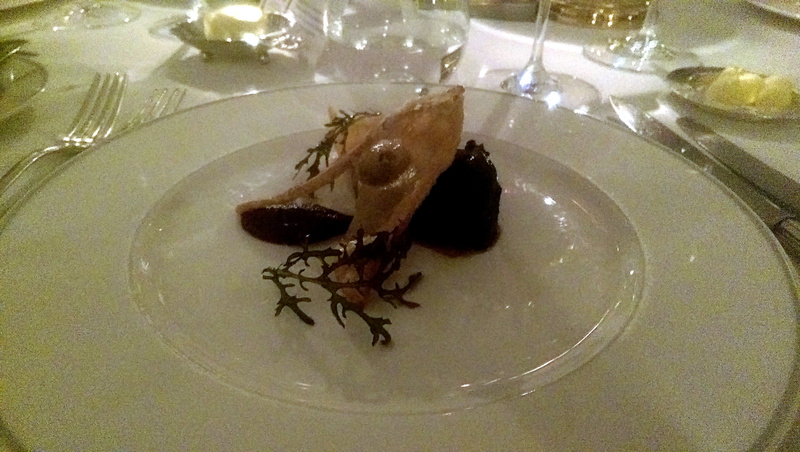 A melt-in-your-mouth braised pork cheek sat alongside a fried ravioli with a little red cabbage ‘condiment’. Everything supremely executed once again, like the scallop I was left wondering whether one more element could have bought things together more completely. Uncomplicated was certainly the case for the last of the savoury courses, essentially some meat with a bit of sauce arrived. But what sauce it was. Venison was immaculately cooked, pink, tender and flavoursome. The medlar jelly sauce though was another level, a better sauce/jus/gravy I have not had. 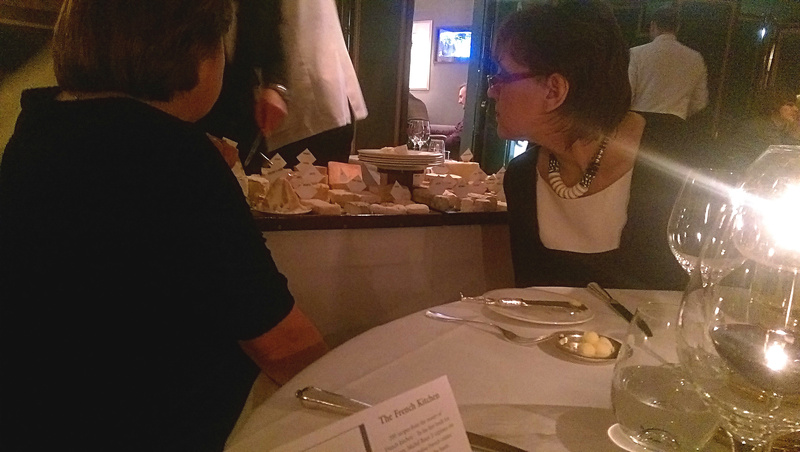 An honourable mention must go to the cheese which does form part of the tasting menu. Two large, marble topped trolleys patrol the dining room with an uncountable number of options to choose from. The chutney and quince jelly that accompanies the cheese was of very high quality too. To dessert, the advertised option being a dark chocolate ganache. One of our party though cannot eat chocolate so a soufflé was suggested as an alternative. I enquired, sucker for soufflé that I am, whether I too could make the switch. The feedback from the dark chocolate dessert was positive but I have no regrets in my choice. A passion fruit soufflé with white chocolate ice cream (vanilla for my fellow diner) was as technically excellent as its first-course counterpart. The combination of sweet, cold ice cream and warm, sharp passion fruit is unrivalled in any dessert I have had. For this experience, decadence and luxury? £120 per person for the food, £200 including matching wines to each course. I had the latter, the wine pairings were certainly good if quite safe and almost uniformly French as you may expect. One noteworthy point is the generosity (and at £200 you might well think they should be) in that if you are particularly enjoying a glass they will happily come and top up. Quite lethal though as you can quite quickly rack up glasses of wine into double figures! Michel Roux Jnr was in on the evening of our visit and happily meets and greets his diners. He is as personable and charming as his media persona suggests, which in comparison to quite a few chefs, is refreshing. Our visit was for the occasion of my mums’s birthday and she was pleased to be pictured with the man himself. Le Gavroche isn’t my favoured style of fine dining. I prefer the more modern Michelin starred cooking of Bains or Rogan. You will be hard pressed through to find anywhere better for classic, exceptionally executed cooking in an environment with such history and opulence.